Harley Davidson FSXT, Twin Cam. I bought it in November last year with all sorts of dreams and plans for it this year, well things don't always go to plan. So the Harley is up for sale, my friend had owned it for approx. The mileage is 21456, MOT expires end of this month but will have a new when sold. Hi, here we have my 2002 Harley Davidson Electra Glide up for sale due to a house move. I've just switched her on and the mileage popped up for about 15 seconds and then went off again. So I can confirm that the mileage is 33,634km which is 20,899 miles. New listingHarley Davidson Fxdxt Dynasuperglide T Sport. Lovely looking bike,le pera seat,vance&hines pipes very loud.bike is on sorn at the minute as I am unable to ride it.it has mot till may 13 but will put new mot on it. This bike was originally sold by Dockgate-20 (now Southampton Harley Davidson). They sold it to the second owner, and to its current owner. Their valuation in October 2016 for this bike was £18,000.00! Custom additions are; 1. Long shot exhaust system (proper Harley sound). Oil temperature gauge. New alternator, rectifier and battery. 96" CRANK AND BIG BORE KIT. CUSTOM PARTS INCLUDE PIECES FROM ,ACCUTRONIX ARLEN NESS JOKER MACHINE LA CHOPPERS PROGRESSIVE SUSPENSION. CUSTOM MADE REAR SETS BY RB KUSTOMS. POWER VISION TUNE IN ECU AND BIGGER INJECTOR. FLHTCUSE Screamin’ Eagle® Edition 2006. Harley Davidson CVO Ultra Classic Electra Glide. Ride smoothly and pull strongly in all gears. Never missed a beat. MOT til Oct 2019. Always garaged. HARLEY DAVIDSON STREETGLIDE SPECIAL ONE OFF CUSTOM. Quite a rare bike in good used condition. Has a strutless rear fender. Side mounted number plate/rear light. Mini indicators ( bulbs ). Pretech front & rear brake callipers. K&N filter. Custom bars. NICE OLD EVO SOFTAIL CUSTOM STAGE ON TUNED LONG MOT. Harley leather sidebag. This is a stunning looking slim. Which doesn't need a penny spending on it. Black Willie G clutch & timing covers. Jack Daniels oiltank cap. Front tinted indicators. Performance air intake. I am selling my Harley Davidson Softail Deluxe . Only had it a few weeks but I have another bike . Just had a full service so full service history . A few marks on the paint due to age but in as new condition . Comes with detachable windshield . Here is a fabulous example of the classic Wide Glide Harley. This "chopper kit" is of German engineering and is very high quality(and expensive), Supplied and fitted by Will Burrows Mc's of Inskip. The engine is the last of the carb models before Harley turned to injected motors. 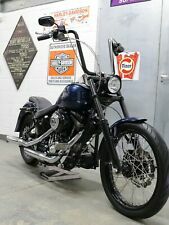 For sale beautiful 2009 HARLEY DAVIDSON SOFTAIL CROSS BONES. Lots of bike for the money at £13995.00. Great looking cool bike with Springer forks, becoming very rare. Flush fuel cap & digital fuel gauge. 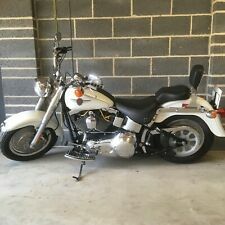 06 plate 11 months mot 24000 miles new rear tyre new pads new battery new starter motor harley alarm and imoberliser 2 keys had full service all leather side luggage runs and rides good the petrol tank has a small dent front fender has a scratch on it but still in good condition the exhaust is vance & hines sound good. Harley Davidson Electra Glide 1690cc in white, having covered 25979 miles. Sensible PX / Swap considered. One owner. Full Harley Davidson service history. Professionally customised. Always garaged & excellent condition. Only 3525 miles. UK delivery available. 3 months warranty. Rammstein themed Harley. Early Evo engine, top end rebuild almost 3,000 miles ago. EV3 camshaft and Mikuni HSR42 flat slide carb. Strong and punchy motor. Recent Hagon rear shocks, progressive fork springs, recent rear tyre and brake pads. Full stainless steel one off wrapped exhaust system, sounds amazing ! I brought the original bike into the U.K from Holland in 2005 and have owned it since. Some health problems mean a reluctant sale. Any questions ? Fire away ! No part ex. THM - Visit us for a test drive - Call us on 01724 866010 or click here to find out more. Had a professional respray back in January. Or any kind of shovelhead. Looking for a Dyna.